ELVN would like to strongly encourage you to attend the community meeting Monday, July 7th at 6:30 pm at the 19th District Police Station on Addison. This is your last chance to voice your concerns about the renovations to take place at Wrigley Field. How will your quality of life be impacted with 22,000 sq ft of additional lighted and sound-producing advertising surrounding the ballpark? How will your quality of life be impacted with an additional 600 fans per game in the neighborhood? How will your life be impacted with the loss of 52 street parking spaces? How will your life be impacted with 2 additional light towers at the ballpark? How do feel about adding another facility at Wrigley capable of serving alcohol to 200 people, bringing the total alcohol serving venues at the ballpark to 23, not counting the vendors in the stands? Monday’s meeting is the time to have your voices heard and let the mayor, landmarks commission, city council and the media know how you feel. Get your friends and neighbors to attend and tell us how your quality of life will be impacted. We need a strong and large presence to show our neighborhood is important to us 365 days per year!! If you are unable to attend and would like your voice heard, send an e-mail to friends@eastlakeview.org no later than 4:00 pm on Monday. We will try to have your e-mail read aloud at the meeting and submitted to the landmark commission. Only e-mails that are signed and include your address will be accepted. Renderings of the Cubs proposal can be seen at http://www.wrigleyfield.com/plan/renderings. 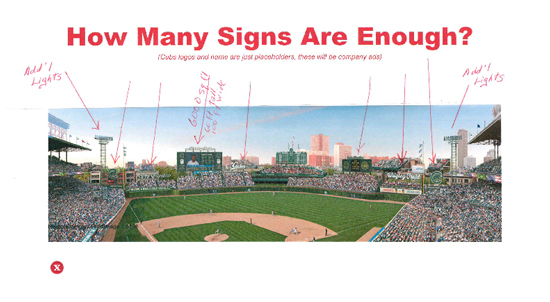 This entry was posted in Community News and tagged Chicago Cubs, Wrigley Field on July 2, 2014 by elvn_updates.